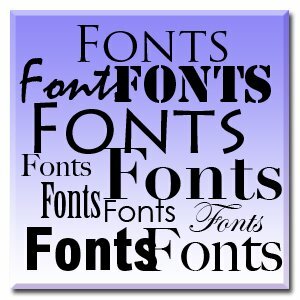 Choosing fonts can be a very hard job and too many in the same layout gets very crowded! For good design it isn’t recommended to use four different fonts on any one layout. Use Three fonts maximum, a headline font to make your message stand out, a sub heading, a general text font and may be one to highlight, but feel confident in using a bold version or an italic version to allow flexibility. Using a family of fonts gives interest and variety to a piece of text and helps to keep the eye interested and attentive. Don’t use fonts that look too similar. They look as if they have just been badly matched, try to find fonts that contrast or compliment. Choose a display font or as said before a headline font, they can be ornamental or pictorial even which adds interest. This can give character to the ensuing text and can give an indication to the nature of the content – you can illustrate the text and create the intended atmosphere using a bold serious style or a light hearted calligraphic or scripted font. Using one display, one serif, and one sans serif is a very good combination. Be objective too, dont insist on a favourite typeface when unsuitable for the content. Be careful of the colours you use as well, some are easier on the eye than others. Being keen on the colour purple, I originally designed my previous blog site with purple text, there were several people who raised their eyebrows and sighed and eventually I was persuaded to change it – the number of views did go up! Choose fonts from sites such as Fontshop and Font Fabric. You can find your font or try to match it at Identifont. With so many to choose from your design will always look fresh and interesting with just a little bit of font forethought! Text manipulation and good typography is as much an art as illustration and good design relies on it. Balanced text, aligned properly and sensibly makes your blog or article a joy to read rather than a chore. Read more on text and fonts, there are a few more articles on the way!